That’s nice, I guess. But what are you doing? Gloria de Piero wrote a little something on Government’s “lamentable” record on women which is worth a read here. To me, and many others in the media, there’s no denying that Cameron has a bit of a ‘women problem’. He’s got just five in his cabinet, and even Maria Miller, David Cameron’s former Culture Secretary, admitted there is a “real problem” with female under-representation at Westminster. That’s without mentioning external problems for women in Britain, on wages, childcare costs, differences in maternity leave, and many more. He appears to be a bit confused on the matter. On the one hand, it doesn’t take five minutes to don a t-shirt, and take a quick picture supporting something. On the other, he cannot possibly support every single campaign out there, he’s got a bloody country to (try and) run. I find it hard to believe that others haven’t refused to wear them, more for a case of a lack of time than anything else. Where’s Nigel Farage’s t-shirt (ha!) or Natalie Bennett’s? But not supporting this campaign that the other two ‘main’ leaders have got on the back off, does make him look bad. Supporting a cause like this could win Ed and Nick some support from the girls, or at least a little bit less hostility. Ed Miliband had the same dilemma during party conference season when he was berated for not agreeing to be pictured wearing a Help for Heroes band, which the other two were happy to do. He was vilified by the Sun for it, and bullied into wearing a damn wrist-band. That doesn’t mean he doesn’t care about war heroes. Perhaps that said more about what he thought about The Sun than anything else. But the media should not be bullying Cameron into wearing a shirt. For one, it’s just a shirt. He’s not a model, he doesn’t need to be pictured wearing fancy clothes, gazing far off into the distance while doing a cute half-smile, pushing his locks back. Second, would it really make much of a difference to feminism, or to feminist causes, if he did wear such a shirt? 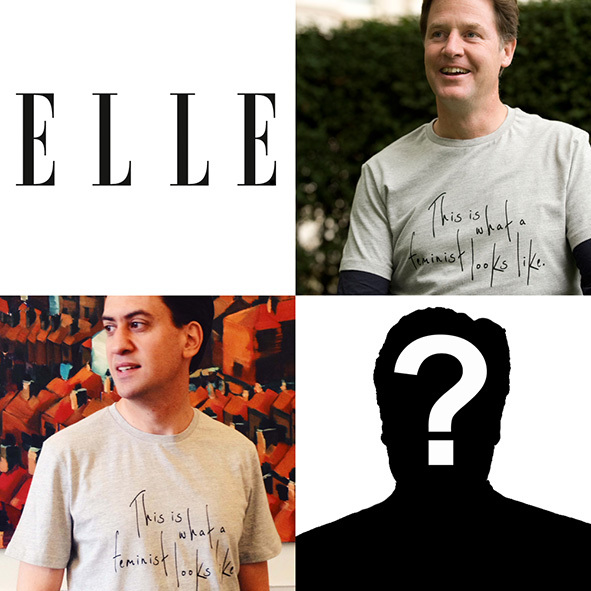 We all know that wearing a t-shirt, or a wrist band does absolutely nothing to suggest you, as a politician, really do care about the issues that you claim to support. What will help women is actions, not words. Equal pay, equal opportunities, equal rights, less discrimination, more women in top jobs, more female role models, any of the above would be welcome Mr Cameron. Wearing a feminist t-shirt does not make you a feminist. I for one, hope David Cameron takes this mini media-storm in his stride and feels motivated to act, rather than wear.